Elegant dining has never been so organic. Sarar by St. Germaine and Euro Ceramica features delicate beading detail on each piece, hand-carved and shaped by Portuguese Artisans. This dazzling collection can be the centerpiece of your next formal event or gathering. Rich with detail, Sarar accomplishes a wonderful fusion of delicacy and rigidity - hand-crafted yet made of durable stoneware. Mix-and-matching has never been easier with Sarar, and it is available in striking Cobalt Blue for a trendy table statement and elegant Natural White for a classic table setting. 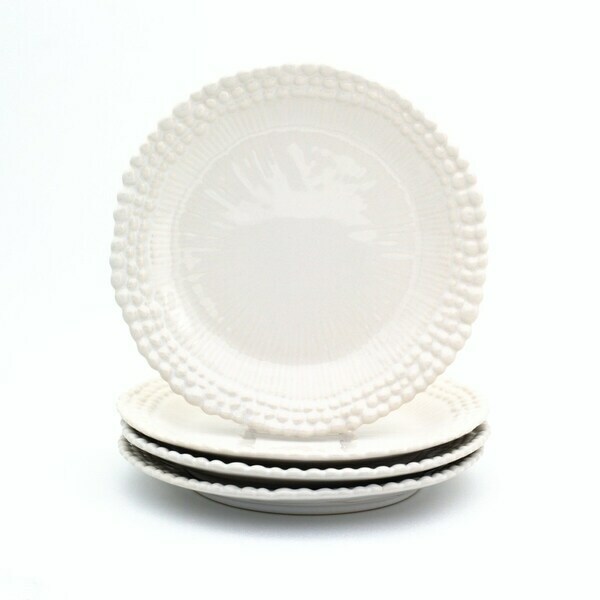 As always, our Sarar collection is lead/cadmium free and microwave/dishwasher safe. Plate size: 8.86" x 8.86" x 0.91"
Dimensions 8.86 In. X 8.86 In. X 0.91 In.